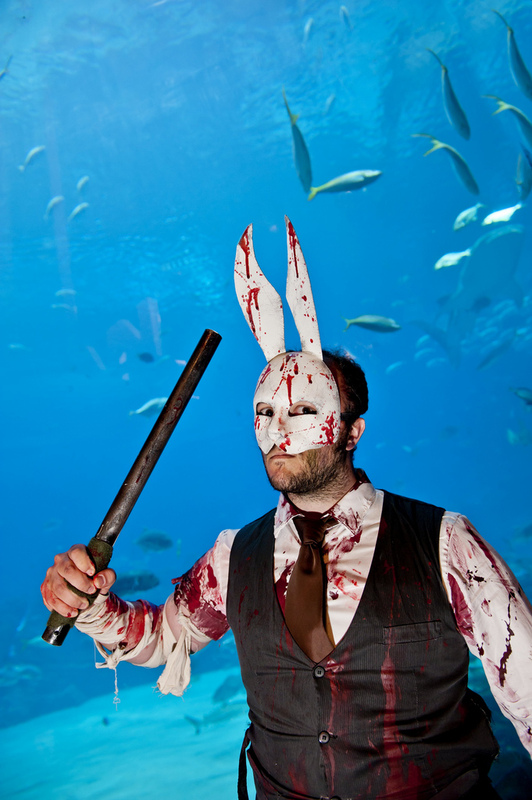 Lazy fish, bloody bunny masks and a few million gallons of seawater make for brilliant BioShock-themed imagery. Atlanta, Georgia is known primarily for three things: William Tecumseh Sherman's pyromaniacal 1864 siege, Outkast's brilliant Stankonia album, and the four Cy Young Awards that Greg Maddux picked up in the early 90s. Otherwise, it's a sleepy, oppressively hot burg wrought from Coca-Cola bottles and fluffy biscuits. Also, it has an aquarium. 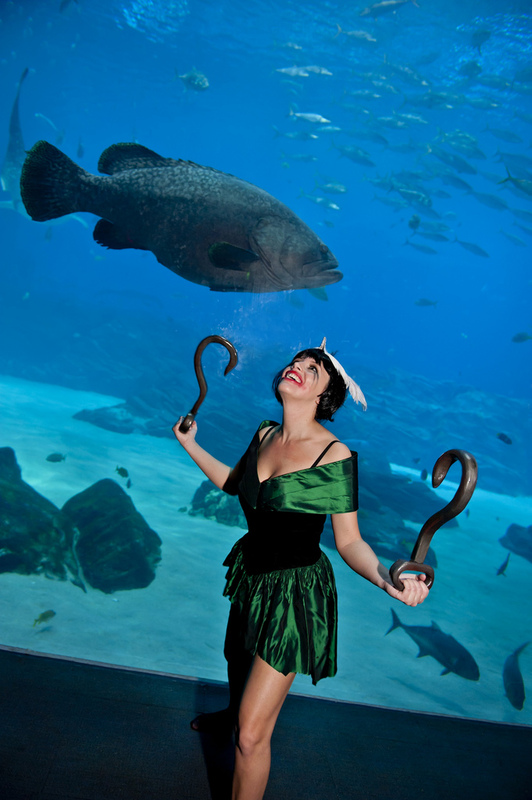 This place, fittingly dubbed the "Georgia Aquarium," contains the usual aquatic beasties, but in a stroke of oft-replicated engineering brilliance, it also includes a section where visitors can stroll beneath the waves in a crude approximation of what it might be like to live in a glassy, underwater city. 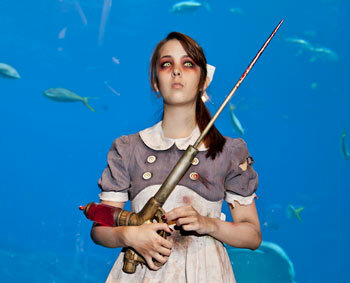 Much like the one seen in the BioShock game series. 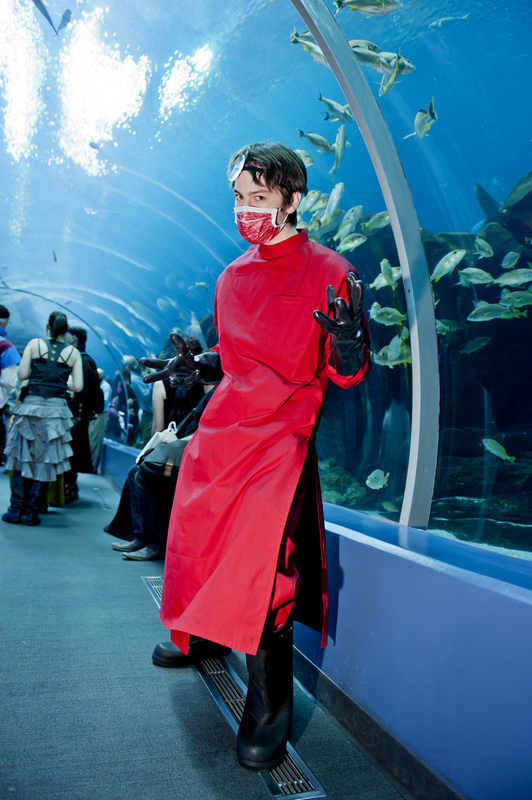 In seemingly unrelated happenings, the recent Labor Day weekend saw hordes of geeks descend upon the city for the annual Dragon*Con gathering. 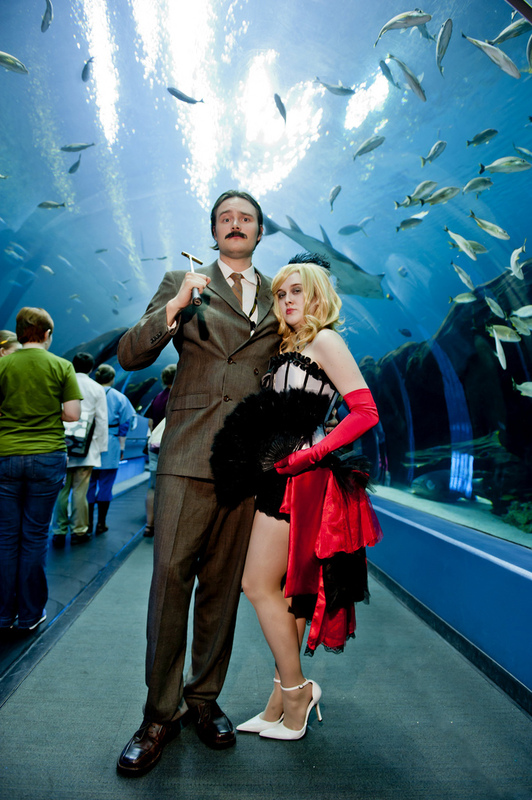 If you've ever attended the event, you likely know that it has become tradition for a large collection of *Con attendees to gather at the Georgia Aquarium. 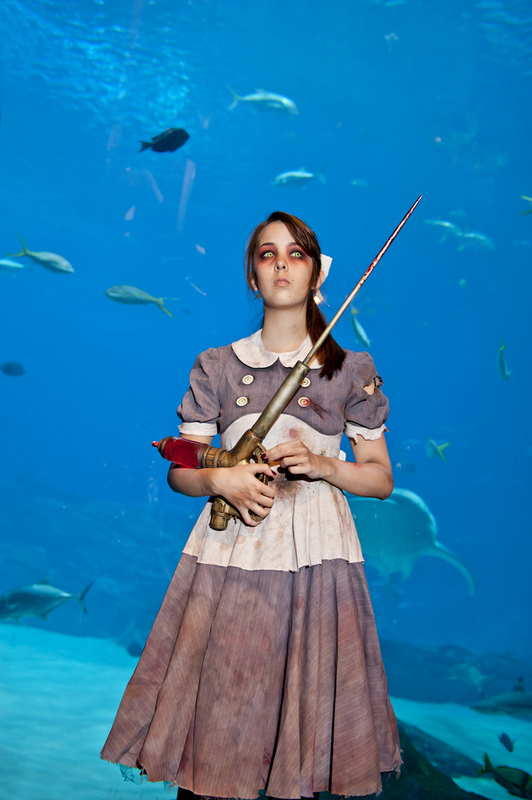 Irrational Games, the people behind the BioShock series, likely put the two events together, and knowing their fans' propensity for cosplaying characters from the series, rushed down to the Aquarium to snap photos of BioShock characters in a close approximation of their natural setting. The result, as you can see from the handful of images in the gallery below (or in the full collection you can find on the firm's Flickr gallery) is rather clever. 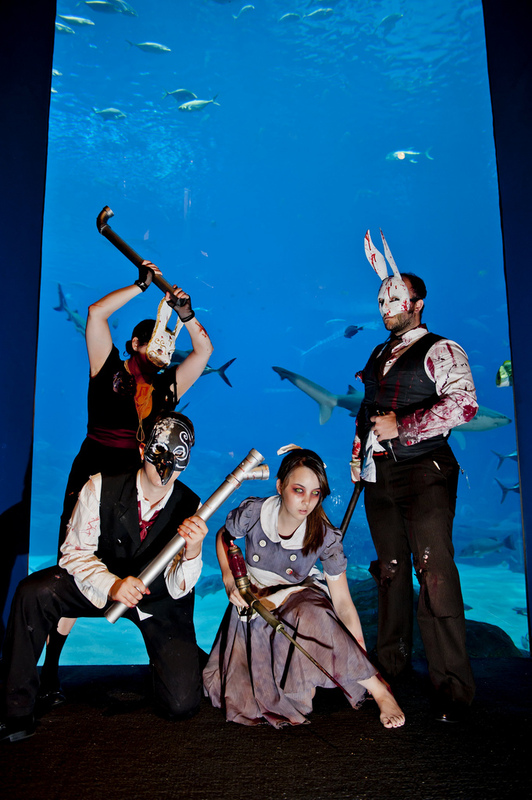 The juxtaposition of maniacal splicers and serene aquatic life is as jarring a contrast as is possible in our meatspace reality without actually dismembering anyone or figuring out a way to shoot bees from one's hands. Though, I have to wonder what the fish think of this whole thing. The comedy answer is obviously that the bunny masks blow their tiny fishy minds, but in reality those are likely the most jaded sea bass on the planet. They've seen it all, and can't be bothered to point out the anti-Humanist flaws in Objectivist theory, no matter how convincing your Little Sister costume might be.